Start and advance your career. Be confident in compliance. OnCourse Learning’s foundation is rooted in our legacy of leading professional mortgage education brands that have supported and nurtured careers for decades including ProSchools, TrainingPro, BankersEdge and Digital University. This expertise fuels our commitment to delivering an outstanding online learning experience for every customer looking to begin, advance, and succeed in their profession. OnCourse Learning Financial Services provides the necessary licensure and compliance training for professionals in the mortgage, banking, credit union, insurance and gaming industries. As an approved education provider by the Nationwide Multistate Licensing System & Registry (NMLS), OnCourse Learning Financial Services offers the industry’s most comprehensive mortgage training solution, with course approvals for all 50 states and U.S. territories. As your partner in mortgage education, OnCourse Learning Financial Services provides you with all the NMLS approved mortgage loan originator resources you'll ever need… all in one place. Our online mortgage education courses are not only NMLS approved, but you will receive the best education possible with our expert courses. Our Mortgage continuing education courses ensure you are introduced to and understand the latest developments impacting the mortgage industry, such as fair lending laws, mortgage fraud and money laundering. OnCourse Learning Financial Services also plays a critical role in building a culture of compliance within hundreds of banks and credit unions across the country. Flagship courses, including Anti-Money Laundering and the Bank Secrecy Act, are accredited by the Association of Certified Anti-Money Laundering Specialists (ACAMS) and are a staple within training programs throughout the financial services industry. 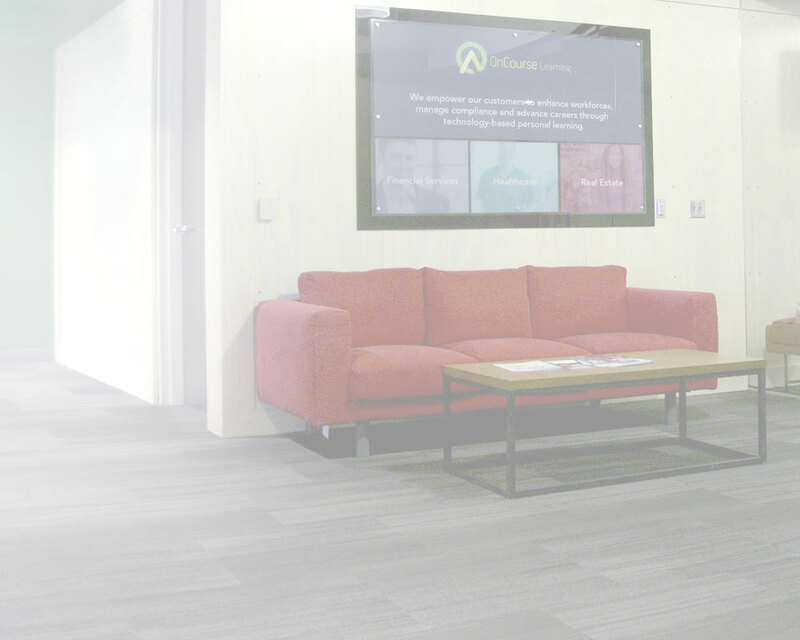 Take a virtual tour of OnCourse Learning's corporate headquarters in Brookfield, Wis.
A collection of best-in-class education companies that are driving professional advancement. Compliance Training for Banks and Credit Unions: OnCourse Learning Financial Services compliance courses are accredited by the Association of Certified Anti-Money Laundering Specialists (ACAMS), an organization representing the international anti-money laundering (AML) and financial crime prevention community. OnCourse Learning instructors are experts in the field of mortgage lending. With over 20 years of experience, our instructors have the knowledge and insight to provide the high-quality training our clients expect. Nancy Ballotta has been leading mortgage loan originators as a pre-licensing education instructor for OnCourse Learning since 2012. Nancy has over 15 years of experience as a loan officer and served as branch manager for several years. With a plethora of industry expertise, Nancy is the ideal candidate to teach newly-licensed mortgage loan originators about the history and current state of the mortgage marketplace. Nancy currently resides in Oregon, where she enjoys playing competitive billiards. April Brandimarte has worked in the mortgage and related industries for over 20 years, with 18 years devoted directly to the loan origination process. Her knowledge and experience on the front end of the mortgage transaction is extensive and includes management of the process from origination through post closing. April’s experience is broad and includes familiarity with origination, processing, closing, underwriting, warehouse line management, training, sales, title insurance/settlement, and notary closing. April is also familiar with compliance issues in the industry, as well as required conduct for mortgage licensees, which makes her an ideal instructor of pre-licensing courses. Because her experience is broad and well-rounded, April offers a unique prospective from a transactional level to those who are seeking a career in the mortgage industry. April has instructed loan originators in a live setting since the passage of the Secure and Fair Enforcement for Mortgage Licensing Act (SAFE Act) in 2008, which resulted in the mandate of education and testing requirements for mortgage loan originators, and as an online instructor since 2013. Her favorite part of the mortgage profession is the opportunity to help people on a daily basis, and April enjoys preparing individuals for success in the mortgage industry through course instruction. Andrij Chornodolsky is one of OnCourse Learning’s senior instructors who has trained approximately 10,000 mortgage professionals across the country. Andrij came to OnCourse Learning with over 15 years of experience in the mortgage and real estate industries. He worked as a mortgage loan officer for American Lending Corporation, Prestige Home Mortgage, and Fidelity Home Mortgage Corporation, and he served as a real estate agent for Prudential. This blend of experience proves to be a powerful combination when tasked to teach mortgage professionals about the landscape of the industry, the existing and developing legislative efforts, and overall operations of loan originators. His insight and experience has groomed thousands of mortgage professionals for successful careers, as well as passing scores on licensing exams. Andrij joined OnCourse Learning in 2004 and has witnessed first-hand the shift in mortgage education needs and requirements. He was a key instructor when only three states required mortgage pre-licensing, continuing education, or a combination of both, and he remains a key instructor as the scope is increased to all 50 states. Through this experience, he has taken and passed many state licensing exams and is very familiar with the test-taking environment. Prior to Andrij’s career in the mortgage industry, he focused heavily on the development and execution of training programs as a consultant. He wrote handbooks, manuals, and full training programs for clients wishing to disseminate messages, policies, and procedures to various departments or entire companies. Andrij is consistently requested by mortgage companies small and large to help them learn the industry and also pass national and state exams. Ed Davis possesses two of the most sought-after qualities in a mortgage education instructor – solid mortgage background and extensive training experience. With more than 15 years in the mortgage industry, Ed’s experience includes many years of origination, branch and sales management, and a focus on broader financial planning strategies. These positions put Ed in an ideal situation to prepare new mortgage professionals for successful careers and to inform experienced mortgage professionals of new and changing legislation and developments. A unique characteristic Ed brings to the classroom is his in-depth experience with the fundamentals of training. He has experience as a corporate trainer - developing curriculum, testing training principles, and designing a presentation conducive to long-term retention. He incorporates real-life examples into his coursework to help better depict industry terms and concepts. Understanding the fundamentals of a classroom, Ed Davis has traveled across the country to educate and inform the nation’s mortgage professionals. Most recently, Ed has used his experience to assist small- to medium-sized mortgage companies remain compliant with industry laws and regulations by delivering training and tracking resources to stay ahead of CFPB regulators. Ed Davis consistently gets extremely high marks on student surveys and is oftentimes specifically requested by OnCourse Learning clients. For nearly two decades Tom Elder has served the financial services industry. He started his mortgage career as a Loan Officer, where he was consistently ranked in the top three sales people within his organization. Tom was quickly promoted to Sales Manager, where he took on the responsibility of training, coaching, and mentoring a team of 15 loan originators. After several years in his role as a top Sales Manager, Tom’s entrepreneurial spirit led him to becoming the owner of a mortgage brokerage. As his mortgage business expanded and revenues increased, Tom turned his focus to developing a reverse mortgage division from the ground up, where he continued to train a staff of 50 in both sales and compliance. Tom has also served as a Reverse Mortgage Consultant for a leading national company where he was tapped to spearhead the company’s continuing education program in Maryland. Currently, Tom serves as Senior Vice President for one of the largest independent insurance brokers in the United States where he initially developed the REO/Lender Placed Insurance Program and now oversees the Mid Atlantic P&C operations for his company. Tom is also the founder and President of a mortgage broker compliance consulting firm. Tom has been teaching with OnCourse Learning since 2011 and is requested regularly to conduct live and webinar continuing education courses. In Scott Genzer’s 30-year career, he has been involved with many facets of the mortgage industry. Scott has experience as a loan officer with local and national lenders. In his role as EVP/Branch Manager, he established the company as the primary lender on several new construction projects, producing high loan volumes. As Executive Vice President, Scott spearheaded recruitment and training of branch managers and loan officers. In addition to his mortgage industry knowledge, Scott has been the speaker for many mortgage training seminars. He was the Pinnacle Performance award winner for 10 years and was a participant from 1995-2006 in Todd Duncan’s Sales Mastery Symposium. Scott currently teaches both pre-licensing and continuing education courses for OnCourse Learning and is often requested by clients to teach live classes throughout the country. Cathy Guinn possesses two of the most sought-after qualities in a mortgage education instructor – solid mortgage background and extensive teaching experience. Cathy’s solid 30 years of experience serving in the mortgage and real estate industry includes positions as a real estate manager, account executive, insurance agent, and notary closer. Her experience includes owning and managing a small training company in which she wrote and conducted mortgage lender training for new and experienced loan officers. These positions put Cathy in an ideal situation to prepare new mortgage professionals for successful careers and to inform experienced mortgage professionals of new and changing legislation and developments. A unique characteristic Cathy brings to the classroom is her in-depth experience with the fundamentals of training. She has experience as a trainer for a reputable mortgage company in which she recruited, hired, and trained an entire sales team in residential loan production. In this position, Cathy was responsible for creating and conducting a training program for all loan officers. In addition, Cathy has a Bachelor of Science in Education. Because of this experience, Cathy is exceptional at incorporating real-life examples and presenting learning devices to help better depict industry terms and concepts. Understanding the fundamentals of a classroom, Cathy has traveled across the country to educate and inform the nation’s mortgage professionals and has written a one-day “basic training” course which is currently being presented via webinar to prepare entry level students for exam success. Cathy Guinn consistently receives extremely high marks on student surveys and is oftentimes specifically requested by OnCourse Learning clients. Cathy is currently a licensed mortgage loan originator in Florida, where she resides. Jill Hoogendyk has helped thousands of individuals realize their dream of homeownership by helping them secure mortgage financing. Jill began her career in real estate as a real estate sales agent in 1984. In 1986, she opened her own mortgage company where she was responsible in overseeing all activities of the company including compliance, training, and supervision of all employees. Jill was the 2009 President of the Arizona Mortgage Lenders Association. She is a certified trainer for the Mortgage Bankers Association and was a 2008 Better Business Bureau Ethics Award finalist. She teaches many different courses in mortgage finance, including pre-licensing and continuing education for loan originators and licensing classes required for mortgage brokers in the state of Arizona. Jill is currently a mortgage loan originator for Intercap Funding with licenses to do business in both Arizona and California. Tim Jeffrey has over 30 years of relevant experience in the mortgage industry. His background includes training and supervising production staffs located at 12 branches and overseeing all aspects of mortgage loan production. He is a results-oriented leader with a 25-year record of managing top performing sales and operations teams. Tim was a member of the Leaders Club in 2002 and 2003, and a member of the President’s Club in 2007 and 2008. Tim has been with OnCourse Learning since 2011 and has been requested numerous times to conduct live and webinar continuing education courses. With over 30 years of experience in financial services-related industries, it is no wonder that Michelle Langford has the knowledge needed to lead mortgage loan originators to success. Michelle got her start in the financial industry at the age of 19 when she worked at a credit union in Georgia. After moving to Tennessee to attend Belmont University, Michelle worked for another credit union in the state, this time in the mortgage department, which is where her interest in the industry originated. Since then, Michelle has held several jobs in banking and mortgage, and has spent time in management positions in which she was responsible for training, including a branch manager position in Tennessee. With her mortgage license on hold after 32 years of originating, Michelle currently dedicates her time to full-time mortgage education training and also holds her realtor license in Tennessee as a listing agent, where she rehabs properties. Michelle’s extensive background as a mortgage expert, as well as a training specialist, makes her an asset to loan originators learning the mortgage business. Larry Miller has extensive experience not only in the field of mortgage lending, but as a trainer and developer of mortgage curriculum. Larry graduated from Brigham Young University in Provo, Utah with BA degrees in Business Management and Public Relations. Soon after graduation, he began working for a savings and loan company where he eventually went on to serve as Vice President, managing the lending activities of the company’s 13 offices, and afterward went on to work for a credit union service organization where he performed lending activities for several major credit unions in the state of Utah. With a great deal of industry experience under his belt, Larry started his own mortgage company in 1994, which grew to include 12 offices throughout the state and became one of the largest in Utah in terms of originations by a non-depository institution. Larry developed a formal training program for loan officers and processors entering the industry, and in 2002, this program became one of the first training programs for mortgage loan originators and brokers recognized and approved by the state. Larry also created pre-licensing training curriculum for real estate agents, which he taught in a classroom setting, and developed the first online training course approved by the state for both real estate and mortgage pre-licensing. Soon after the SAFE Act was passed in 2008, Larry began working with NMLS to become an approved provider of mortgage pre-licensing and continuing education. By 2014, Larry’s company had become the third largest mortgage educator in the nation, joining forces with OnCourse Learning in 2017. Larry maintains an active mortgage loan originator license, as well as a real estate license, and continues to teach industry professionals. Christa Nadeau has been in the mortgage industry for 20 years involved in originating, marketing, managing, and training. She entered the industry after having graduated from University of Colorado Boulder with a Bachelor of Arts Degree and Secondary Education Certification and then went on to teach high school math and science in Montana. When the SAFE Act was passed, Christa developed NMLS-approved pre-licensing and continuing education curriculum and taught those courses as an NMLS-approved instructor, with which she continues to be actively involved. Her knowledge and expertise has helped many mortgage loan originators understand all aspects of the mortgage industry. Bill Pellow joined the OnCourse Learning instructor team in 2015 and brings with him a wealth of knowledge and experience in the mortgage industry. Bill started his mortgage career as a Senior Loan Consultant with a large mortgage company, closing over 30 loans a month. He then continued his career with the same company as the Director of Web Sales, a position in which he managed a team of 20 loan officers. In 2004, Bill started his own mortgage company and oversaw a group of eight loan consultants. Bill currently owns and operates a small realty firm of five realtors. Currently a senior loan officer for a mortgage company in Pennsylvania, Michael Rey has close to 20 years of experience in the industry, including positions with several other mortgage companies. Michael is knowledgeable about issues pertaining to the industry, including those that are especially relevant to mortgage loan originators entering the profession. In addition, Michael spent time working as an admissions representative, in which he delivered presentations, ensured compliance with state and federal regulations, and maintained relationships with students. Michael’s mortgage knowledge, paired with his experience in education, makes him an ideal instructor for both new and existing mortgage loan originators. Michael has a Bachelor of Arts in Economics from the University of Pittsburgh. With close to 25 years of experience in financial services-related industries, it is no wonder that Tania Walker has the knowledge needed to lead mortgage loan originators to success. Tania has a Bachelor of Arts degree in Business from Western Michigan University and is a member of the Colorado Association of Mortgage Brokers (CAMB), as well as a member of the Colorado Mortgage Lenders Association (CMLA). Tania’s experience includes work as a processor and then as a sales representative at a title insurance agency , an operations manager at a closing services company, a retail loan officer, a wholesale account representative, and most recently, as a mortgage loan originator with licensure in 42 states. Tania has an extensive training background and expertise in the area of regulatory compliance, which makes her an asset to loan originators learning the mortgage business and ensuring they understand how to remain in compliance with the law. Jim Wiltse has been an NMLS-approved mortgage instructor since 2010. He began his career in the financial services industry in the 1990s, working in both insurance- and mortgage-related fields. Jim is certified by the International Distance Education Certification Center (IDECC), a program endorsed by over 40 jurisdictions throughout the United States and Canada, a clear demonstration of his expertise in the field of education. Jim is a native mid-westerner who transplanted to the Pacific Northwest after spending over 20 years as a professional photographer traveling through almost the entire United States.